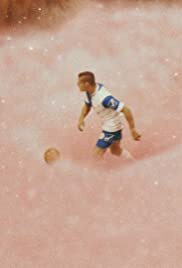 The film centres on the not too bright but gorgeous soccer hunk DIAMANTINO (parodying Cristiano Ronaldo) losing the final match for Portugal in the World Cup held in Russia 2018. Reason was his imagination of hush puppies during the game. Too bad Portugal did not enter the finals or semi-finals. But this does not matter for director Gabriel Abrantes, whose film contains a totally outrageous plot involving lesbian detaches infiltrating his home, wicked twin sisters and a Dr. Lambourghini pumping the soccer player full of hormones. This could be something right out of a Pedro Almodovar or an Alex de la Iglesias movie, but Abrantes does not know what to do with his material. The result is a very bland film despite some great sets and wardrobe. This film was chosen to close the Midnight Madness series.